Models are the primary resource used by the Teiid Designer. 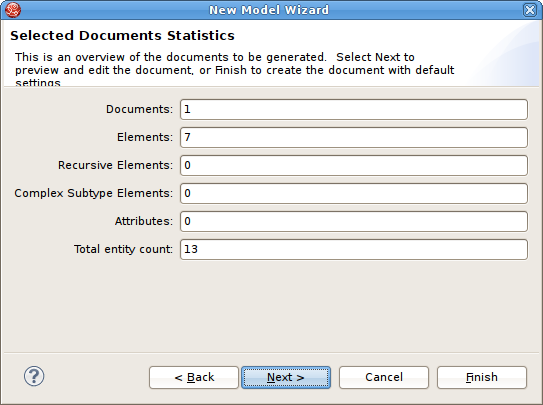 Creating models can be accomplished by either directly importing existing metadata or by creating them using one of several New Model wizard options. This section describes these wizards in detail. 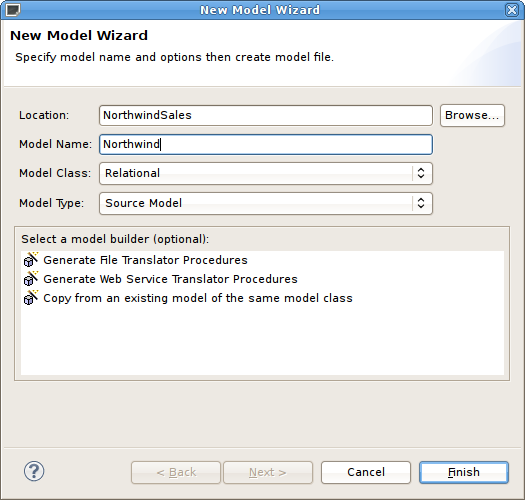 Use one of the following options to launch the New Model Wizard. Choose the File > New... > Metadata Model action . Select a project or folder in the Section 10.2.1, “Model Explorer View” and choose the same action in the right-click menu. Select the New button on the main toolbar and select the Metadata Model action . Model names are required to be unique within Designer. When specifying model names in new model wizards and dialogues error messages will be presented and you will prevented from entering an existing name. Step 1 - Launch the New Model Wizard. Step 2 - Specify a unique model name. Step 3 - Select Relational option from Model Class drop-down menu. Step 4 - Select Source Model from Model Type drop-down menu. Step 5 - Click Finish. You can change the target location (i.e. project or folder) by selecting the Browse... button and selecting a project or folder within your workspace. Copy from existing model of the same model class. This builder option allows construction of a relational model containing one or more of the procedures required for accessing file-based data via a file translator. 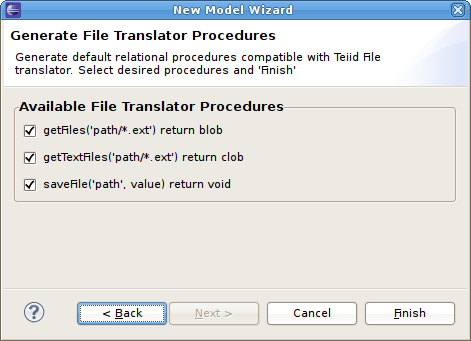 Step 5 - Select the model builder labeled Generate File Translator Procedures and click Next >. The Generate File Translator Procedures dialog will be displayed. This builder option allows construction of a relational model containing one or more of the procedures required for accessing web-service-based XML data via a web s translator. Step 5 - Select the model builder labeled Generate Web Service Translator Procedures and click Next >. The Generate File Translator Procedures dialog will be displayed. This builder option performs a structural copy of the contents of an existing model to a newly defined model. You can choose a full copy or select individual model components for copy. 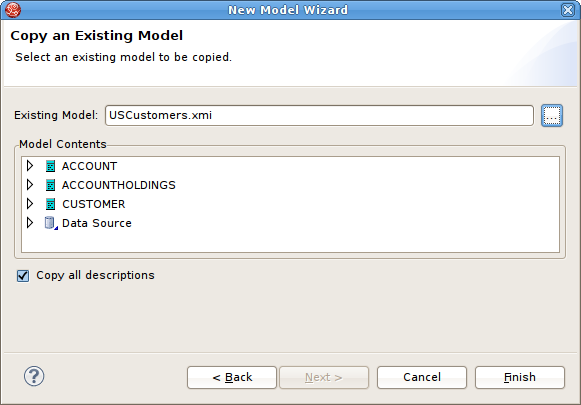 Step 5 - Select the model builder labeled Copy from existing model of the same model class and click Next >. The Copy Existing Model dialog will be displayed. Step 6 - Select an existing relational model from the workspace using the browse button. An existing model will be pre-selected if a relational model in the workspace is selected in the Section 10.2.1, “Model Explorer View” prior to starting the new model wizard. Step 4 - Select View Model from Model Type drop-down menu. This option is only applicable for creating a relational view model from a relational source model with the added feature of creating default transformations (SELECT * FROM SourceModel.Table_X) for each source table. The steps are the same as for the Section 2.2.1, “Copy From Existing Model” described above. There is an additional option in the second page of the wizard which can automatically set the relational table's supports update property to false. If this is unchecked the default value will be true. In the Teiid Designer you can use your existing schema models to generate relational view tables. Step 1 - Select any XML Schema model (XSD) in in the Section 10.2.1, “Model Explorer View” tree. Step 2 - Right-click to display the context menu and select the Modeling > Create Relational View Model from Schema action. 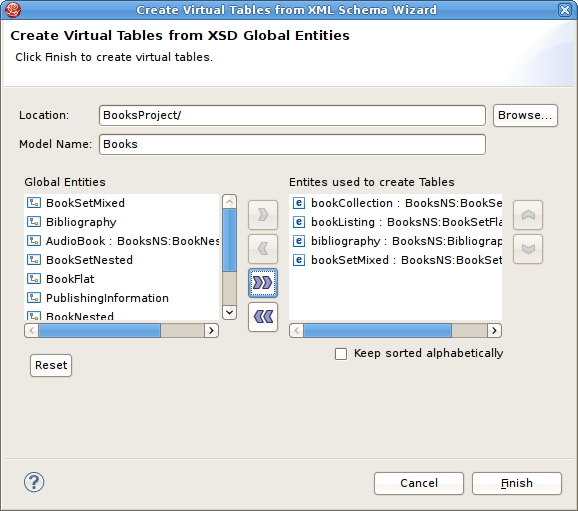 Step 3 - In the Create Virtual Tables from XSD Schema Wizard dialog, specify a relational view model name. Step 4 - Select one or more global schema entities and move from left panel to the right panel. Click Finish when done. When model generation is complete the new model will be opened in an editor for your viewing. Step 3 - Select XML option from Model Class drop-down menu. Build XML documents from XML schema. This option creates an XML View document model based on a selected XML schema and its dependencies. 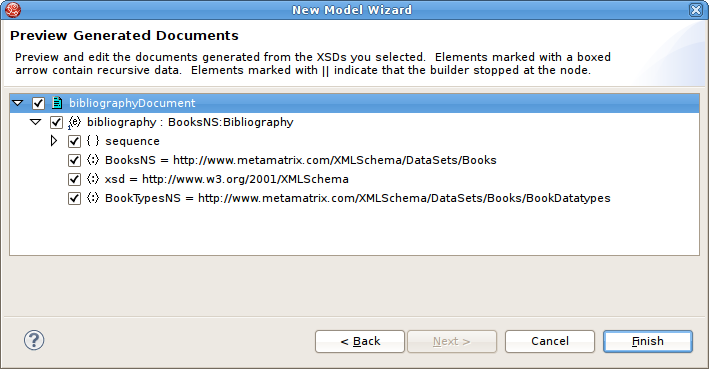 Step 5 - Select the model builder labeled Build XML documents from XML schema and click Next >. 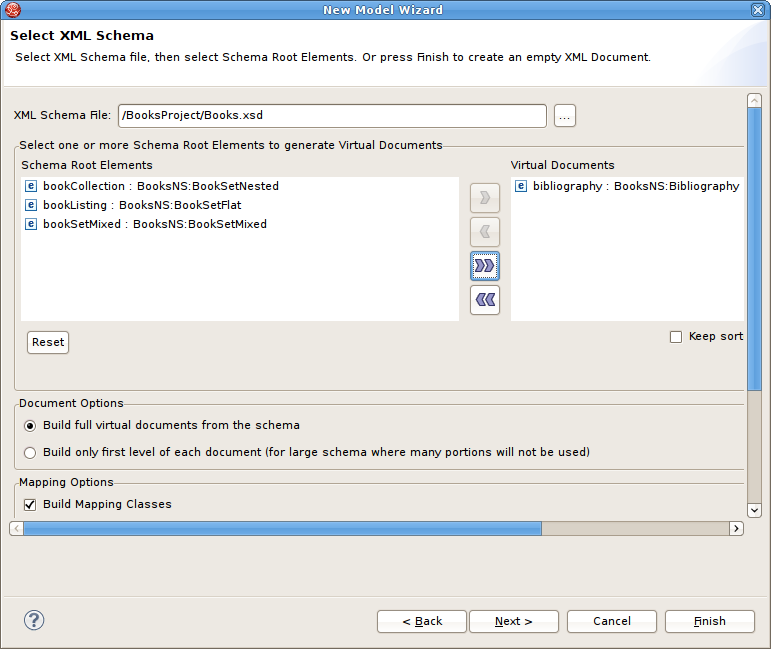 The Select XML Schema dialog will be displayed. Step 6 - Select an existing schema model from the workspace using the browse button. An existing model will be pre-selected if an XSD model in the workspace is selected in the VDB explorer prior to starting the new model wizard. The schema must be found in the workspace so if you need to get one or more into the workspace use the XSD Schemas on file system importer. Step 7 - Move the available schema root elements you want to become virtual documents in the new model over to the Virtual Documents list by using the arrow button for selected elements or the button to move all elements. Step 9 - Click Finish to create a model of all selected document entities or (optional) click Next > to view Selected Documents Statistics page which shows document entity statistics and gives you an idea the size of the model being created. Step 10 - (Optional) Click Finish to create a model of all selected document entities or click Next > to view Preview Generated Documents page that allows you to exclude document specific entities then click Finish. For deeply nested schema, your total entity count may be large. If so, displaying the preview may take some time. Step 3 - Select XML Schema (XSD) option from Model Class drop-down menu. Step 4 - Select Datatype Model from Model Type drop-down menu. Step 3 - Select Web Service option from Model Class drop-down menu. Build from existing WSDL file(s) or URL. 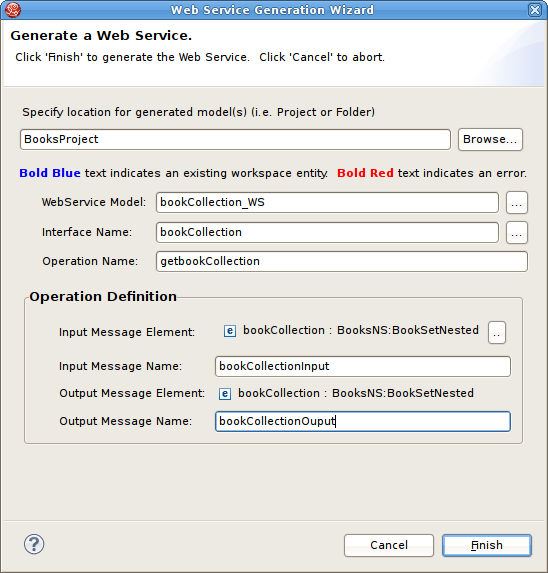 This builder option creates a Web service model based on a user-defined WSDL file and its referenced schemas. In addition, applicable XML schema files and XML View document models (optional) are created. Step 5 - Select the model builder labeled Build from existing WSDL file(s) or URL and click Next >. The remaining wizard steps are identical to those found using the Section 3.7, “Import WSDL Into Web Service” action option. Web Service models and their corresponding Interfaces and Operations can be generated in Teiid Designer from XML View model components. Namely, XML View Documents and XML View Document roots. Step 1 - Select either a single XML Document or single XML Document root in Section 10.2.1, “Model Explorer View”. Step 2 - Right-click select Modeling > Create Web Service action . Step 3 - Fill in missing properties in Web Service Generation Wizard shown below. Step 4 - Click Finish to generate model. When model generation is complete, a confirmation dialog should appear. Click OK.
Users can change the Web Service Model and Interface Name values (via "..." buttons) to use existing Web service model components. This will create a new operation in an existing model. Step 3 - Select Model Extensions option from Model Class drop-down menu. Step 4 - Select Model Class Extension from Model Type drop-down menu.